Brittany, the rocky arm of France that juts far westward into the sea, is a country all its own. Washed by the English Channel on the north and the Atlantic Ocean along the rest of its jagged 750-mile coastline, it’s a misty and magical place defined by the dramatic meeting of land and sea. The Celts, who arrived on the peninsula in the 6th century BC, divided Brittany (or Armorique, as they called it) into two parts: Armor was the land near the sea, and Argoat the forested interior. While that interior—the legendary Arthurian land of the Holy Grail and the site of Merlin’s mysterious forest of Brocéliande—is enticing, nowhere in Brittany is the scenery as breathtaking as along one stretch of its northern coast, the Côte de Granit Rose or the Pink Granite Coast. Spectacular formations of pink to red granite line the shore, carved by waves, wind, ice, tides, salt and spray into shapes ranging from a monumental Devil’s Castle and giant Elephant’s Foot to a huge, delicately balanced Clamshell and a precariously poised upside-down Bottle. In some places the granite has broken into a tumble of rosy rocks the French aptly call a “chaos”, in other spots it’s eroded all the way down into soft pink sand. Contrast these warm colors with the blue, gray or bottle green of the changing sea and the wildflower-studded greenery of the moorland that tops the cliffs, and you have a remarkable setting for an idyllic Breton séjour. 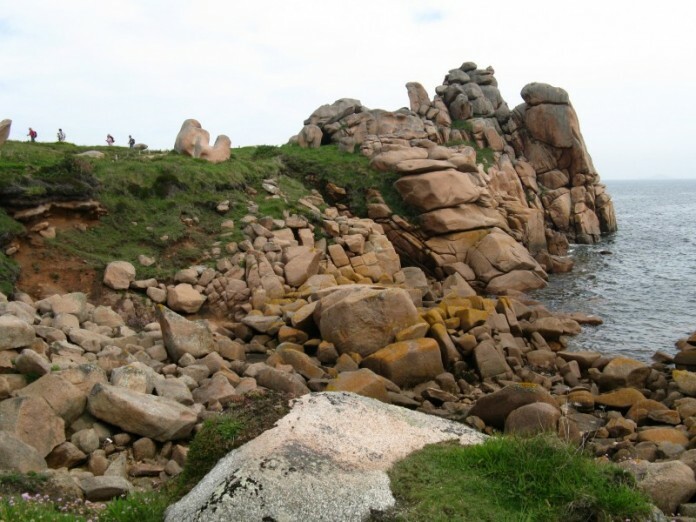 Part of the Corniche Bretonne that stretches between Perros-Guirec in the east and Trébeurden in the west, the Côte de Granit Rose is most spectacular between Perros-Guirec and the little village of Ploumanac’h. Happily, that stretch is also the most accessible, thanks to a wonderful 3-mile walking trail that is part of Brittany’s Sentier des Douaniers. The Sentier, a trail created at the time of the French Revolution to guard against smuggling, follows nearly the entire Breton coast for 800 miles, from Saint-Malo in the north to Saint-Nazaire in the south. Once patrolled day and night by brigades of customs officers on the lookout for boats carrying contraband from England, it is now a protected natural site and part of the network of official Grande Randonnée hiking trails. If names like Trébeurden, Perros-Guirec and Ploumanac’h don’t sound French, it’s because they’re not. Linguistically and ethnically, Bretons have more in common with the Irish and the Welsh than with the French. Those early Celts of Armorique were not the peninsula’s first inhabitants—those were the still largely unknown raisers of megaliths—but Celtic tribes were here when the Romans arrived, and still here when they left and the barbarian invasions began. In the 5th century AD more Celts, belonging to the Briton tribe, arrived, chased from Grand Bretagne (Great Britain) by the invading Angles and Saxons; these newcomers not only brought Christianity to Armorique, they changed its name to Petite Bretagne. Petite Bretagne eventually became just Bretagne, but by that time the Breton language rivaled the emerging French language, itself derived from Low Latin. By the 9th century Breton was spoken throughout the peninsula up to the border with Normandy; Norman invasions gradually pushed it, and the Celts, seaward, toward Finisterre. But the language (and many of the customs) survived. In 1985 bilingual road signs were installed throughout Brittany (or Breizh); some Breton place names resemble the French version, others, like Landreger for Tréguier, do not. Perros-Guirec (from Pen Roz, the top of the hill, and Guirec, a local saint), with its beaches, port, turn-of-the-century seaside villas and plentiful hotels and restaurants, is the ideal headquarters for exploring the Côte de Granit Rose. The walk to Ploumanac’h, which starts near the Gare Maritime at the beach of Trestraou, takes about an hour and a half, and the best time to do it is at high tide, when waves hurl themselves against the rocks with maximum force. Breton life has long been lived to the rhythm of its tides, which are particularly spectacular on this northern coast; tourist literature includes tide tables, and it’s worth timing your walk for the morning from Perros-Guirec to Ploumanac’h, or the late afternoon in the opposite direction. 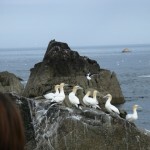 Better still, do it both ways, with a leisurely seaside lunch in Ploumanac’h before your return trip. No special footwear is required—you’ll see everything from hiking boots to ballerina flats on the trail. You’ll also meet walkers of every age, from sturdy gray-haired hikers to babies pushed in strollers. During high season—July and August—the trail can be crowded; at other times you may have it to yourself. Be prepared for famously changeable Breton weather—brilliant sun, brief showers, and chilly mists so sudden they seem summoned by witchcraft. If you read French, and want to identify the rocks that have acquired somewhat fanciful names (we never did find the profile of Louis XI), stop first at the downtown Office de Tourisme for a booklet that explains the numbered markers along the trail as well as the coastal geology and flora. The vegetation is most luxuriant at the start of the trail—you’ll see pines, cypresses and even some palm trees near the beach. As you climb gradually to the clifftop heath, gulls wheel and scold overhead. Depending on the season, purple heather, blue flax flowers or golden-yellow broom brighten bushy banks of privet and tamarisk, and in a few spots the vegetation arches right over the trail, forming a green tunnel. The herbal fragrance of grasses and plants mingles with the iodine scent of the sea, and as you climb you’re rewarded with a panoramic view of the Sept-Isles, the largest seven islands in a sea studded with rocky outcroppings. The granite at Perros-Guirec is mostly yellow, white and black, but soon the scenery changes completely. After the sheltered little smuggler’s cove called Porz Rolland you’ll see pink granite formations on both sides of the trail. 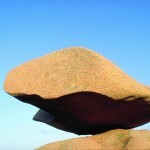 Prized for its rosy color, the granite is quarried not far from here; the deposit is estimated to be nearly 4 miles deep. While walkers are urged to remain on the trail to preserve the vegetation, there are plenty of places, such as the mammoth Château du Diable, where you can scramble on, under and around the rocks and even get a face full of sea spray if you like. You’ll pass a few manmade structures—some picturesque villas that predate coastal building restrictions, a boathouse for lifesaving operations, a mysterious little chapel on whose roof three gargoyle-like creatures crouch, a round hut that once sheltered customs men, and the Maison du Littoral, which contains exhibits and conducts geological walking tours during high season. By the time you reach the pink granite lighthouse you’re in a rocky landscape too harsh and salty for most plants. 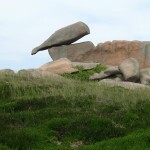 A few recognizable formations line the trail between the lighthouse and Ploumanac’h, including the Lovers, the overturned Shoe and the Skull. Whiffs of eucalyptus from a private seaside garden signal the end of the route, which dips down through tall pines and cypress to deposit you on the wide beach of Saint-Guirec in the pretty village of Ploumanac’h. A little shrine on the beach holds the statue of Saint Guirec, one of many uncanonized Breton “saints” recognized only by locals. The pink granite statue with a disfigured face replaces an earlier wooden one that also suffered from a strange local custom: Girls wishing to marry within the year came here to stick a pin in the saint’s nose. Several excellent restaurants in Ploumanac’h can satisfy hungry hikers with anything from a simple galette and crêpe lunch accompanied by bubbly cidre brut to a full-fledged plateau de fruits de mer complete with crab, shrimp, prawns, delicious Prat ar Coum oysters, and smaller bulots and bigourneaux to winkle out with little pins. If you don’t feel like walking back to Perros-Guirec, your restaurant can call you a taxi. But Ploumanac’h is worth an after-lunch stroll, especially to see its little port, once filled with fishing boats, now with pleasure craft. Two square granite structures facing each other on opposite sides of the channel are medieval moulins à marée, mills that used the tides as power to grind grain (at the period of highest tides here, there’s a difference of 33 feet between high and low). 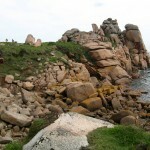 While the Sentier des Douaniers is the highlight of the Pink Granite Coast, there are many other inducements to while away a few more pleasant days: within a 20-mile radius you’ll find more beautiful beaches and outcroppings of pink granite, ancient dolmens and menhirs, and several medieval churches. In Perros-Guirec, weary muscles can be soothed at the very luxurious Agapa Spa or the simpler but highly restorative thalassotherapy (seawater cure) center on the beach at Trestraou. 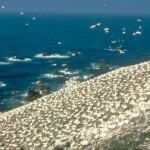 But there’s one other must: a boat trip to the Sept-Isles, a bird sanctuary where 40,000 fous de Bassan (northern gannets), yellow-headed sea birds nearly as large as the albatross, congregate during nesting season. It’s an amazing sight, even if you don’t understand the excellent explanations given in French by the crew. Twelve bird species shelter there, and depending on the season, you may see common murres, razorbills, crested cormorants and, with any luck, the adorable Atlantic puffin, a chubby little clown of a bird with a red and yellow striped beak and red triangles around his eyes. 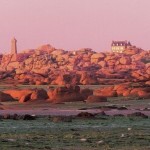 Finally, on the way back to the mainland, you’ll have an unforgettable view of the Côte de Granit Rose from the sea. Le Mao A thatched-roof restaurant with a large terrace, serving crêpes and terrific seafood platters. 14 rue de Saint Guirec, Ploumanac’h, 02.96.91.40.92. Vieux Gréements Charming crêperie in a beautiful old stone building. 19 rue Anatole Le Braz, Port of Perros-Guirec, 02.96.91.14.99. Centre de Thalassothérapie A seawater spa with hydromassage baths, saltwater pools and a full roster of massages. Most clients go for week-long cures, but stop in to see if you can book a few treatments. Plage de Trestraou, Perros-Guirec, 02.96.23.28.97. Musée de Perros-Guirec An old-fashioned museum with exhibits of lacy Breton coiffes and other traditional garb, as well as a fascinating documents and maps room. The upper floors contain a very dated wax museum that nevertheless gives vivid glimpses into local history; recorded English narration available. Allow 1 and a half hours. 51 blvd du Linkin, Port of Perros-Guirec, 02.96.91.23.45. Originally published in the July/August 2008 issue of France Today; updated in July 2012.